Abstract: This note describes how Terry the Trader might approach his day in the Internet Financial System as envisaged and created by Systemics. When a trader opens shop for the morning, there are a number of priorities. After the coffee machine is booted up, Terry the Trader (a name I just thought up!) will want to check the latest price on the instruments he is interested in. After Terry has started up WebFunds, it will show two wallets in the main box - Trader and SOX. We'll ignore SOX here, it is similar to Systemics Trader but without any trading capabilities. By clicking on the Trader icon, Terry's accounts are revealed . Each account is its own space, totally independent of the others ; which enables Terry to set up separate accounts for different purposes. By clicking on the account, a group of sub-accounts is revealed. A sub-account is simply a single Ricardian instrument that is accessed by that account. In the Ricardo world, each account can have one sub-account for each and every instrument that exists. These are created more or less on demand. In the Trader wallet, one of the sub-accounts is special  This one is the base money against which the others are traded. Bear this in mind as we continue. Terry will now select the most important financial instrument to him, and right-click on it to bring up a menu. 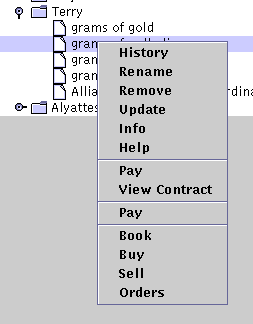 This menu will display many options; Terry goes straight for the Book option and clicks on that option. Up pops a new window - the trading book for this instrument. Initially blank, Terry clicks on Update in order to request the latest from the market. Now, several things happen. Systemics Trader uses the SOX protocol built into WebFunds in order to securely communicate with the market. In order to set up a secure channel of information, SOX now contacts the market, using the context of the account, and does an authenticated key exchange. This allows future requests to be encrypted with secret keys, which is a fair bit faster than using public key cryptography. This process takes a little time, from 10 to 30 seconds, each time that WebFunds starts up. After the first one, though, the account has established the secure channel, and further communications should proceed more rapidly. Once done, Terry will see the prices of bids and offers in that instrument. The prices for the bids to buy are on the left most column, and the prices for the asks to sell are in the next column. Sizes are in the third column, and finally, there are listed nicknames for the traders against some orders . Terry can also click on the Change button at the top of the screen, which provides a "Level-II" style of interface. It is the same information, but arranged differently, and might be more familiar to those with NASDAQ experience. 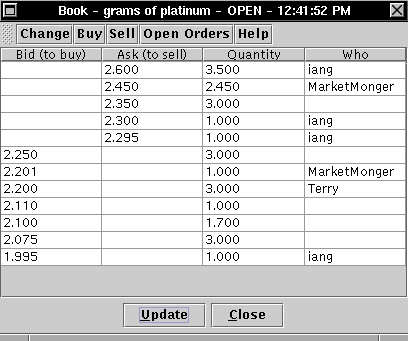 Having checked the price, Terry clicks on the Open Orders button, and brings up a new dialog showing his orders currently active at the market. By clicking on one of the orders, and then hitting Update a request will be launched to get a progress on that order. If any movement has happened, the Fulfilled and New columns will change with the number already traded (bought or sold) and the new price offered, respectively. Price changes always occur in Terry's favour, and are caused by either limit orders that are placed in excess of the pertaining market price, or because of opening auctions. Whilst the coffee machine gargles away, Terry will decide that some orders are no longer useful. He can highlight them and hit Cancel which will send a new request of to the market to cause it to terminate the order in its current condition. That order will terminate when the market receives and processes the instruction. 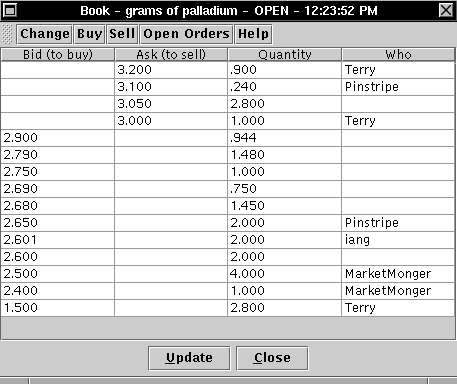 Assuming all has gone according to plan, the order leaves the book immediately (click on Update to get the latest), and moves across to the settlement process, which will be reflected in a new status of Traded as shown on the Open Orders dialog. Currently, the internal settlement process within the market takes about a minute, after which time Terry's account will be directly paid out for the order  . After that time has elapsed, Terry can hit Update on the bottom of the dialog and check the results. The request will check the mailbox at the market for the account, and this mail item will include both the receipt for the mail item and the receipts for the settled payouts. The order is now settled, and the cash and/or instruments will be available in the account for further trading or other transactions. With Terry's first cup of Trader Brew in front of him, he is now ready to hit the market with some fresh orders. To do a sell order, Terry clicks on the Sell button on top of the book. This brings up a new dialog which offers a price box and a size box, as well as some order options. As Terry wants action immediately, he sets the size and clicks on the Market option and then hits the SELL button at the bottom. This immediately launches a market sell to the market, which ignores any price setting and requests the market to find the best price available on the book. The request that goes to the market includes the instrument to sell, thus allowing the market to guaruntee real time gross settlement . When the order is accepted, the little message box announces that the order to trade is Posted! and shows a market identification number for the order. 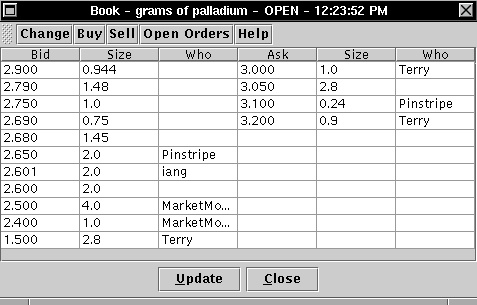 Figure 6: Market Sell - Posted! Terry can refresh his Open Orders dialog and see the new order listed as Posted. He can also update the book and see the effects of the order; in this case, the market sell would have had immediate effect and some listed buy orders would have either reduced their quantity or have disappeared off the book. His order would have been executed within seconds of arriving at the market, and will settled quickly using the normal process. Once the previous sell has been settled and paid out, Terry would have freed up some cash. As his strategy is to shift across from one instrument to another, Terry now goes back to the main WebFunds dialog and selects another instrument, right-clicks to bring up the menu and selects the Book for that instrument. When he's updated that book he can also click on Buy and bring up the order dialog. Taking his guide from the book, Terry sets up a price and a size and hits BUY. This new order gets launched to the market in limit form, indicating that Terry is in the market to purchase at the price indicated or better. In order to make this order, the request includes a payment for the amount of cash required for that order, plus extra for some fees. That cash will have come from the previous sale that Terry just made; as that order has now been settled, Terry has the funds to finance the purchase immediately. With a new updating of the book, Terry checks his order is sitting there waiting for action, and heads for his second cup of coffee and to check the latest news on the markets. Ian Grigg can be reached at iang at systemics dot com. How to click differs a little depending on how Java is implemented. Normally, a double-left-click on the file symbol or the word will do it, or a single-left-click on the little stickle icon to the left. On MacOS this click is normally a straight click. 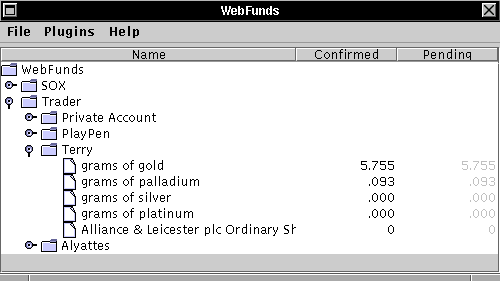 That is, the market doesn't know that they are all from the same WebFunds client, but WebFunds obviously does, and provides a common addressbook, for example. The Trader wallet and trading in general is an application that extends onto the basic payments world of Ricardo. Trader is a 3rd-party application that uses the plugin capabilities of the WebFunds programme. Nicknames are shown when the account has registered its own nickname, and for all others who have done so. That is, if you supply your nickname, you can see the others. This is an experimental feature. The market works out what the position is with that order and transfers the funds in cash and instruments directly into the account that placed the order, and also places the completed order receipt in the mailbox of the account. The time of a minute should come down dramatically in the future. Strictly put, the sell request includes a payment for the appropriate amount of financial instrument. The exchange settles that payment immediately into its own accounts. If a buy, the payment will be in the base cash instrument that the financial instrument is traded against.